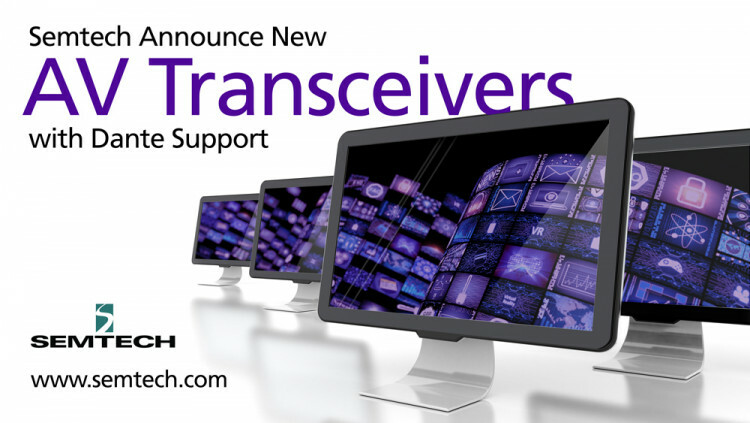 Semtech Corporation (Nasdaq: SMTC), a leading supplier of high performance analog, mixed-signal semiconductors and advanced algorithms, today announced that the first AV transceivers based on Semtech’s BlueRiver™ NT2000 AV-over-IP chipset that provides support for Audinate’s Dante™ audio are now available from Aurora Multimedia, an SDVoE Alliance™ member. BlueRiver NT2000, with support for Audinate’s Dante, is completely interoperable via the BlueRiver API giving system designers a broad toolkit they can use to create very efficient and cost-effective networks. BlueRiver-based solutions are ideal for education, healthcare, enterprise, entertainment, hospitality, retail, house of worship, government, military and industrial environments – wherever the need for uncompromised zero-latency 4K video arises. Aurora’s IPX Series is the industry’s first 4K2K transceiver with zero compression and latency over a 10Gbps network. The series is also one of the first to take advantage of power over Ethernet (PoE) with Huawei 10Gbps network switches. Integrated features like seamless/break-away switching, web server, video wall processing, and an optional slot to add other IP capabilities such as ExtremeUSB® (USB 2.0 over IP) or Dante audio provide a complete AV-over-IP solution on a 10Gbps network. Semtech’s BlueRiver platform, developed by the AptoVision product engineering team, provides advanced chipsets for AV signal distribution. The award-winning BlueRiver technology has forever changed the dynamics of the Pro AV industry by letting installers and OEMs replace proprietary AV matrix switches with off-the-shelf Ethernet networks that deliver dramatically better price/performance, flexibility and scalability. Enabling end-to-end systems for AV and KVM signal extension, IP-based switching, video wall and multi-view applications, BlueRiver chipsets are the foundation of SDVoE technology, offering zero-latency, uncompressed 4K streaming over standard Ethernet with unique support for HDMI 2.0a and HDR. They also integrate high-fidelity video scaling, windowing and audio downmixing. For more information, visit www.semtech.com/aptovision. Aurora Multimedia products incorporate state-of-the-art technologies that surpass typical specifications and features. From the introduction of the industry's first non-proprietary, Web-standards-based IP control systems and touch panels, to today's advanced SDVoE™ and IPBaseT® IP video distribution solutions –Aurora has been a dominant force in the AV industry. Advanced AV processors with scaling, multi-image rotation, and dual/quad display processing only add to our highly adaptive, diversified product line. Aurora provides solutions for a variety of global markets, including government, education, security, hospitality, corporate, and house of worship. For information, visit www.auroramultimedia.com. All statements contained herein that are not statements of historical fact, including statements that use the words “ideal for,” “designed to” or other similar words or expressions, that describe Semtech Corporation’s or its management’s future plans, objectives or goals are “forward-looking statements” and are made pursuant to the Safe-Harbor provisions of the Private Securities Litigation Reform Act of 1995, as amended. Such forward-looking statements involve known and unknown risks, uncertainties and other factors that could cause the actual results of Semtech Corporation to be materially different from the historical results and/or from any future results or outcomes expressed or implied by such forward-looking statements. Such factors are further addressed in Semtech Corporation’s annual and quarterly reports, and in other documents or reports, filed with the Securities and Exchange Commission (www.sec.gov) including, without limitation, information under the captions “Management’s Discussion and Analysis of Financial Condition and Results of Operations” and “Risk Factors.” Semtech Corporation assumes no obligation to update any forward-looking statements in order to reflect events or circumstances that may arise after the date of this release, except as required by law.